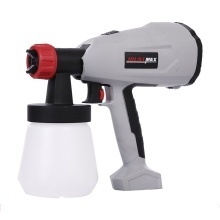 This is a professional industrial spray machine that can be used to spray latex, paint, etc. Due to its compact size and light weight, it can also be applied to cakes and chocolate spraying. It is a multifunctional spray machine. Quick disassembly device, self-removable, easy to use. Adjust the knob to control the flow, the coating surface is even and detailed, the adhesion is strong, and the jetting force is strong. The spraying force can be mastered, and the soft rubber handle is more comfortable. The heat dissipation position is porous and symmetrical, which ensures easy heat dissipation and guarantees the service life of the machine.